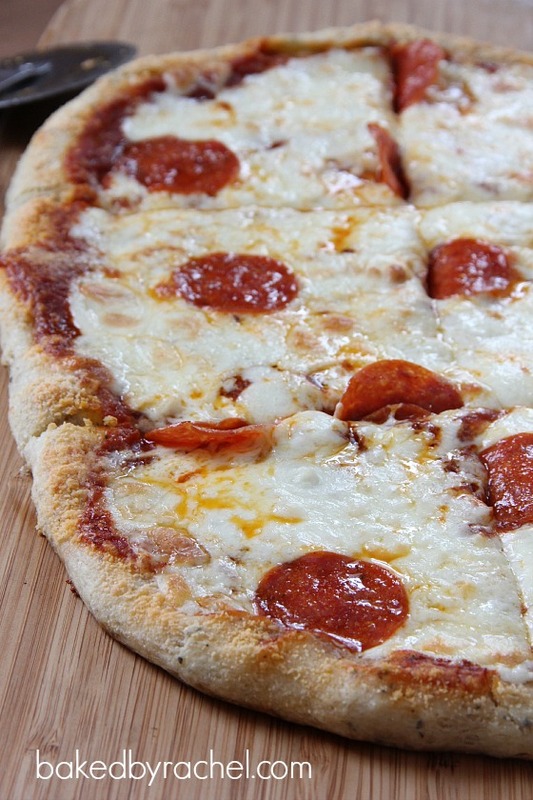 Change up pizza night with this recipe for garlic bread pizza. All of the flavor you want from garlic bread, but in the most amazing pizza. The dough and multiple varieties of cheese are key to this delicious recipe. Do you have a standard pizza night in your house or do you just wing it and get take-out or make homemade whenever the mood strikes? For a while I was trying to stick to Friday night pizza, a fun way to end the week and kick off the weekend but it doesn’t always happen that way. I did however make this last Friday and holy moly did I want to share it with you right then and there, but no… it had to wait. I’m a food tease like that I guess. Then again, any food blogger that’s on Instagram is! Okay, so I have a major problem with pizza. And I don’t mean because I’m obsessed with it. I mean because there is zero consistency when you get it from the local pizza place. One week it could be amazing and greasy just how you hope and the next it’s over cooked and doesn’t have nearly enough cheese. Sigh. My standards for pizza are kind of high. That brings me to this… I truly have come to hate take-out pizza. I love it for it’s convenience but the unknown drives me bonkers! We honestly only get take-out for it’s convenience and our laziness… and let’s be honest – for the mozzarella sticks because when those are good, wow are they good. Hot, cheesy and greasy – just how they should be! 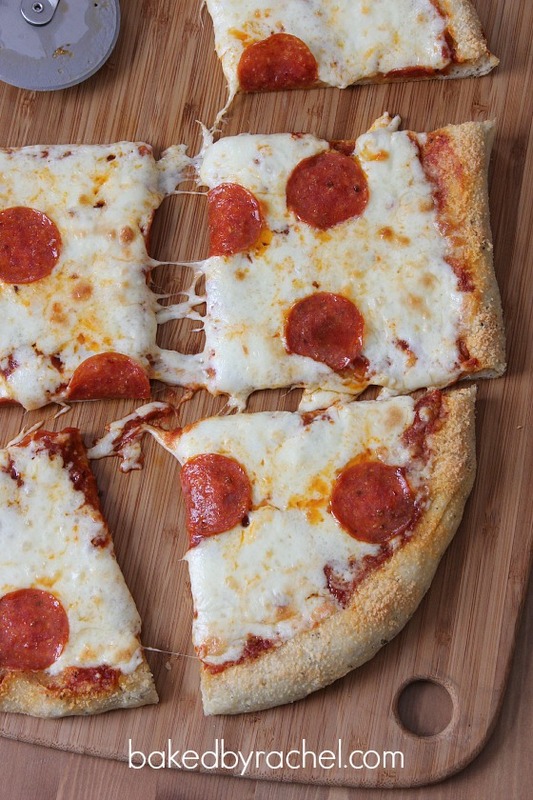 But no… I’m going to do my best to avoid getting take-out pizza because it’s SO ridiculously easy to make. Honestly, if you don’t think you have time to whip up dough for a specific night, it’s completely okay to make it the night before and let it sit in the fridge. Seriously! Or make a few batches and freeze them to thaw whenever your heart desires. This dough is super easy to whip up and the final results are out of this world amazing. No, I’m not kidding. 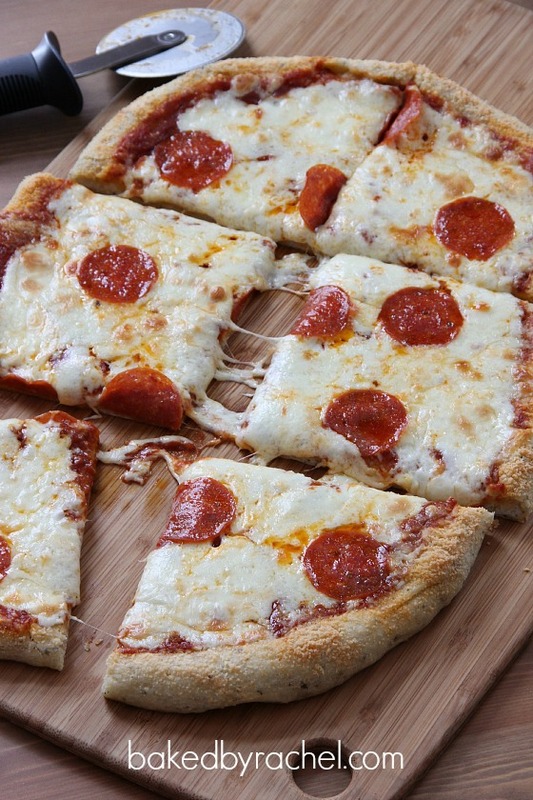 It’s like garlic bread and pizza all wrapped into one heavenly slice. Seasoned dough, garlic infused butter and the multiple varieties of cheese absolutely make this pizza what it is. Do not under any circumstance skimp on the butter, garlic or cheese. You’ll regret it. If you want your pizza, this pizza or any pizza, to be taken to the next level – you absolutely positively must use whole milk mozzarella cheese. I’ve always grabbed what was easiest – the pre-shredded stuff you can find in the store. Only my store stinks so my options are limited. While skim milk mozzarella isn’t awful, heck that’s what we’ve been using for ages and have loved it, whole milk will change your world. No joke. One last note, or maybe two… this dough isn’t like your standard pizza dough. It’s slightly more bread like, a bit more dense but totally scrumptious. Also, if you happen to have leftovers, reheat this in the oven for 5-10 minutes. It’s doubly amazing the second go-round. Never ever ever will I (or you too hopefully!) microwave leftovers again. All of the flavor you want from garlic bread, but in the most amazing pizza. The dough and multiple varieties of cheese are key to this delicious recipe. 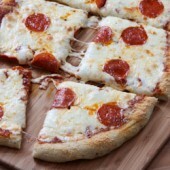 Desired additional toppings, such as pepperoni, peppers etc. In a medium measuring cup, dissolve yeast and sugar in warm water, allowing to proof. Meanwhile, in the bowl of a stand mixer, mix together 2 1/2 cup flour and remaining dry dough ingredients. When yeast mixture has activated and proofed, turn mixer on low and slowly add yeast mixture to the bowl. Mix until a smooth ball forms, adding additional flour as needed. Transfer dough to a large lightly greased bowl, flip dough once to coat in oil. Cover and allow to rise for one hour or doubled in size. Lightly grease a baking sheet. Shape dough to desired size and shape. Brush dough lightly with butter. Bake for 5 minutes. Add toppings as desired: sauce, cheese, pepperoni, etc. Brush outside crust liberally with butter and minced garlic. Immediately sprinkle edge crust with Parmesan cheese. Bake for 15-20 minutes or until cheese is melted and crust is lightly golden. Store leftovers covered and chilled. Reheat as desired.